The artist as an outsider hero has been a staple of literature since at least the days of Wordsworth and Coleridge. Elizabeth Hand's particular take on this romantic trope is to make the artist a punk. It is a version she has presented before in Generation Loss (2007), and in her latest novel, Radiant Days , it is explicit, in part because one of her central characters is the original punk poet, Arthur Rimbaud, and in part because her other main character is a 1970s graffiti artist. In 1870, the fifteen-year-old Rimbaud ran away from home. His formidable mother had already made his father leave home, and now, the country at war with Prussia, the schools closed, and his passion for poetry being stifled, Rimbaud decides to run away to Paris. Without money and, to be honest, without much of a clue, he gets arrested for vagrancy and spends time in prison before he is rescued by his teacher. These misadventures, however, do nothing to dampen his urge to get away, and after a chill winter with his equally chilling mother he sets out once more. And it is along a canal heading towards Belgium that he encounters an old tramp fishing. In parallel with these events we read the story of Merle, eighteen years old and just starting at the Corcoran School of Art in Washington DC in 1977. Despite the slight difference in their ages, the two protagonists mirror each other closely. She is a painter who will use words in the graffiti that first gets her noticed; he was a poet who often used startling visual imagery (though Hand's own translations of some of the poems into a modern demotic—"he hits them upside the head"—don't really do him justice). She, too, is the product of a broken home; her bullying father has long since chased off her mother. And while Rimbaud is heading towards his mysterious and violent homosexual relationship with Paul Verlaine, Merle, in the opening pages of the novel, begins a lesbian relationship with her teacher, Clea, a relationship that will itself prove destructive. At first, the two threads run along parallel lines. While Rimbaud finds himself oddly relishing the degradation of his time in prison, we see Merle both relishing and resenting the attention she gets from Clea. When Clea takes Merle to visit a fancy New York gallery (which marks the first crack in their relationship as Merle feels her work is being exploited), they see an early tag by the graffiti artist Jean-Michel Basquiat, a nod to the person who is clearly a model for Merle. This inspires Merle to create her own tag, "Radiant Days," an oddly sunny response given everything we have been told about her. But as the Radiant Days graffiti start to appear around Washington, so Merle's life begins to fall apart. She drops out of art school; she breaks up with Clea, who steals many of her best pictures; and on the day she is forced to leave her squat, a bag containing all her other pictures is stolen. It is as she is wandering the streets of Washington, homeless and helpless, that a tramp fishing by a canal directs her to an old canalside building. It is here that she meets Arthur (though it will be some time before she realizes who Arthur is), and the two spend a night walking the Washington streets together. The encounter helps each to see their own world very differently, until Arthur slips back into his own time while they are running away from the cops. The tramp, Ted, who has engineered this meeting is, of course, no tramp. He is a figure from mythology, though in Merle's world he has taken the form of a talented but washed-up rock musician who acquired a massive local reputation but never quite made it as a star. Now, his integrity established by the fact that he eschewed the trappings of stardom, his talent established by the fact that everyone Merle meets knows who he is, he lives on a broken down canal boat and makes a little money by busking. He provides Merle with a place to stay for the night, and she repays him with a portrait which will later help launch her career. The trouble is that until she draws this picture Ted seems to have had no reason to appreciate her as an artist, which in turn means that we never really understand why he might have arranged this cross-time meeting. That is just one of a number of niggling little questions we are left with as the novel progresses, in part because Rimbaud was someone whose whole life has left us with niggling and unsettled questions. Merle gets to meet Arthur once more, in Paris at the very start of the commune. During this encounter they witness the murder of a policeman by the mob, an event that really did happen and that may well have inspired one of Rimbaud's more famous poems. Yet we still are left to wonder: what are these cross-time meetings giving to either of the participants? There is a suggestion that some of the more vivid imagery in Rimbaud's poems might have derived from his fleeting glimpse of late twentieth century America, but, as with the murder of the policeman, most of his inspiration does not seem to come from his encounters with Merle. Of course, Rimbaud was a real person with an established body of work. It should be much easier, therefore, to show his influence upon Merle's art. But even here there is no real sense that their two meetings actually do feed into her creations. In the final pages of the novel, Merle does become a famous artist, but the two things that seem to drive this career are her graffiti, inspired by Basquiat's work, and her work on music posters and album covers that stems entirely from her portrait of Ted. In other words, the supposed cross-fertilization of their meetings does not seem to have any substantial effect upon the art that defines both characters. The other thing we might anticipate in such cross-time meetings is that we might thus fill in or explain some of the odd lacunae and inexplicable occurrences in Rimbaud's biography. But in fact his mutually destructive relationship with Verlaine, his sudden abandonment of poetry, even his later gun-running in Africa are not made sense of or presented in a fresh or unexpected light by these events. There is a final encounter, their eyes meeting silently across a crowded room, that seems to be there purely for sentimental reasons, to provide an apparent happy ending for Rimbaud: we imagine him walking contentedly away to destroy his life. 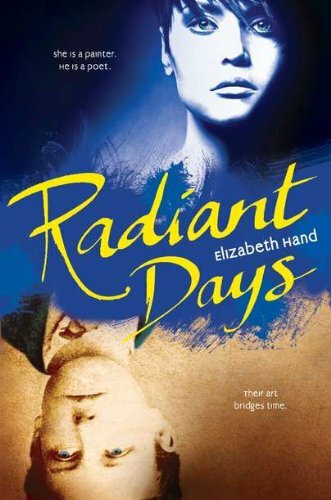 Radiant Days is published as a YA novel with a fairly simple moral about dedication to one’s art, but that is not an excuse. This is not a bad novel. The writing is as good as we always expect from Elizabeth Hand; the characters are well drawn, and the three central figures in particular, Arthur, Merle and Ted, are attractive and engaging. And yet the whole thing feels slight, as if she has conjured these two parallel people, the punk poet Rimbaud and the punk artist Merle, without ever quite knowing what to do with them. So as much as we enjoy the story, we are left with a sense that there is always something more, something deeper, that the novel never quite reaches. May I observe that Jean-Michel Basquiat was much, much, much more than a graffiti tagger. Patti Smith's Just Kids illuminates some of this era -- and Rimbaud was an early and deep influence for her -- and has the added brilliance of being true -- and Smith's capacities with language! At the time the novel is set, Basquiat was not well known. Part of the conceit of the novel is that Merle is inspired to start tagging when she happens to see a graffito by Basquiat on her first visit to New York, as a result she goes on to create the first graffiti tags seen in Washington.